Choose the Eco-Forward¨ cold-cup solution. 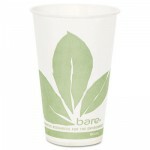 Treated paper cups offer superior rigidity as well as four-cups-to-one-lid convenience (from 12-oz squat to 22-oz tall). Perfect for any cold beverage. Compostable in commercial facilities. Includes 20 packs of 100.